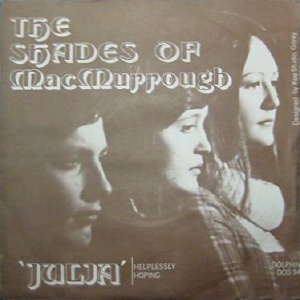 MacMurrough, or Shades of MacMurrough as they were known initially until September 1973, was a trio formed in Ferns Co.Wexford in 1971 by Paul Kavanagh and sisters Mary and Josephine O'Neill. They were a ballad group in the Emmet Spiceland tradition. 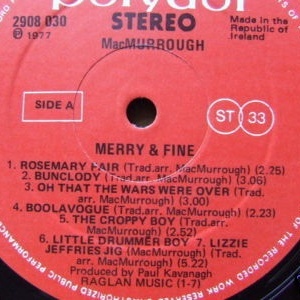 Between 1972 and 1978 they recorded three albums for Polydor Records which are now highly prized by folk fans. 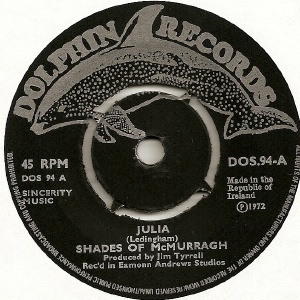 Their recording debut was a close harmony pop version of "Julia", written by John Ledingham AKA Jonathan Kelly. 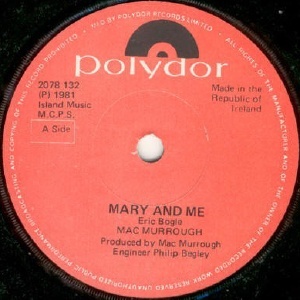 This was released as a single on Dolphin Records in 1971-72. 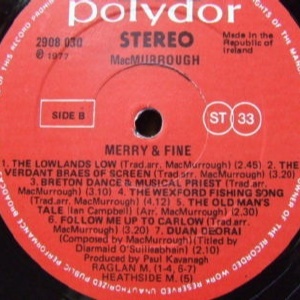 They made several appearances on RTE television, signed to Polydor in 1972, won the Kilkenny Beer Festival ballad contest in 1973, and recorded their first album Carrig River. 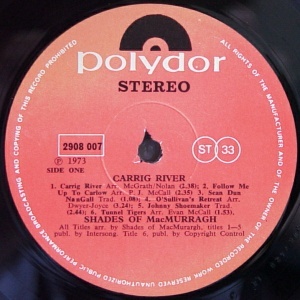 Released in 1973, Carrig River is a collection of Irish poems and ballads, many of which had been recorded several times before by various artists over the preceeding 10-20 years, especially during the ballad boom. 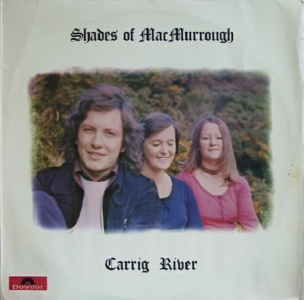 What makes Carrig River really stand out is the calibre of the arrangements and the beauty of the vocal harmonies. Familiar material is re-cast and brought back to life through subtle instrumentation including 6- & 12-string guitars, spinet, autoharp, tin whistle and bodhran, and sublime vocal harmonies. This album is highly recommended. 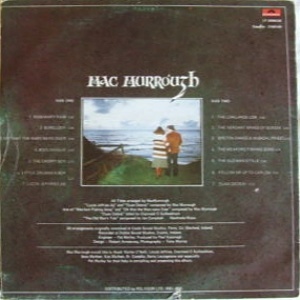 The title track was released as a single. The band's third single came out in 1973. 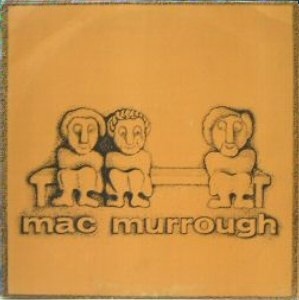 Credited to MacMurrough, both sides are non-LP. 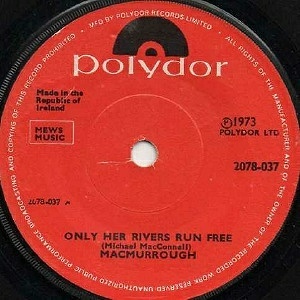 "Only Her Rivers Run Free" / "Lord of the Dance" was issued in a picture sleeve. 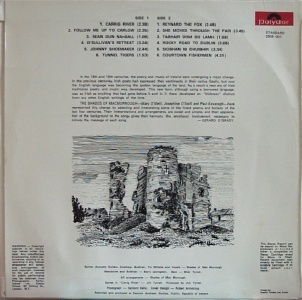 The self-titled second is the most adventurous of theie three albums and is now considered an acid folk classic. 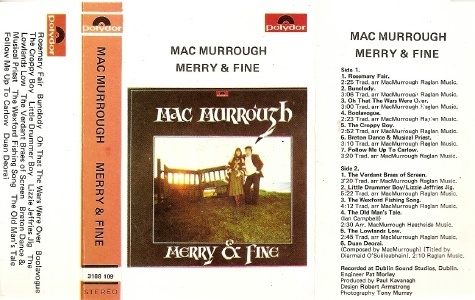 Released in 1974, it expands on the debut with a broader range, better production values (thanks to Donal Lunny) and richer instrumentation including guitar, dulcimer, lute, spinet, glockenspiel, tin whistle and bodhran. It includes English and Irish ballads, a 15th century Latin hymn "Deus Meus", and the definitive version of "A Kiss In The Morning Early", a song usually associated with Michael Hanly. The vocal harmonies are outstanding and the arrangements are brilliant throughout. This is probably their best album. The debut runs a close second and both albums are quite different. The second is sophisticated where the debut is exhuberant. 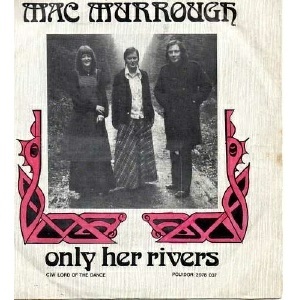 The second is certainly the more sought after by acid folk fans worldwide. 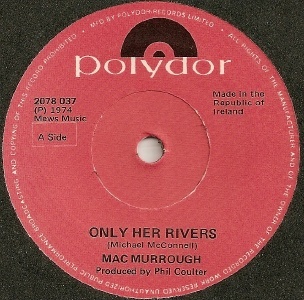 Polydor apparently only pressed 500 copies. 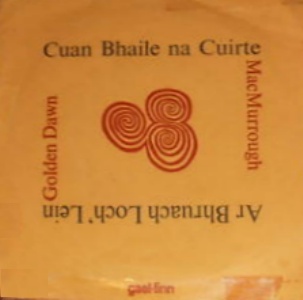 Another non-LP track emerged on a split single with Golden Dawn, one of a series released by Gael Linn in 1974. 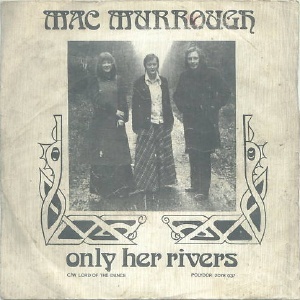 "Cuan Bhaile Na Cuirte" later turned up on the From Lagan To Lee sampler album on the Wavin Pipes label, housed in a fabulous sleeve designed by Jim Fitzpatrick. 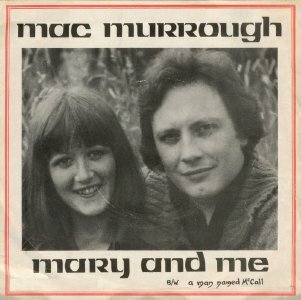 By the time recording began for a third album in the autumn of 1977, MacMurrough was now a husband and wife duo. Paul and Mary had married and Josephine had stopped performing. 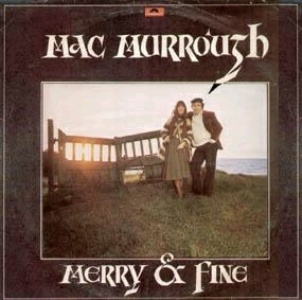 "Merry & Fine" was released in 1978. 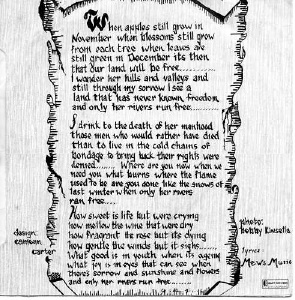 It shows that they'd broadened their range to include Scottish and Breton folk as well as some contemporary material. It's well played and the vocal harmonies are superb but it also shows that they had begun to suffer the problem that often afflicted ballad groups who don't write their own material. Their repertoire of songs was drying up and their ideas for new arrangements for songs were lacking, and so they began to copy others. The album lacks the originality in arrangement, the delicate attention to detail, and the magical feel of the earlier albums. There were two later, non-LP singles in 1981 and 1984 respectively, neither of which is remarkable. 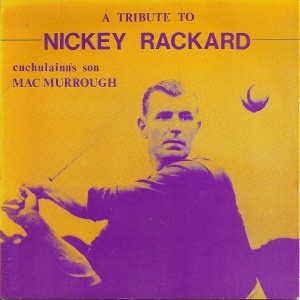 The second "Cuchulainn's Son" is a tribute to Nickey Rackard, a famous Wexford hurler. K7 - Polydor Records - 3188 002 - IRL 197? 8-Track - Karussel/Polydor Records - 3843 060 - UK? 197? 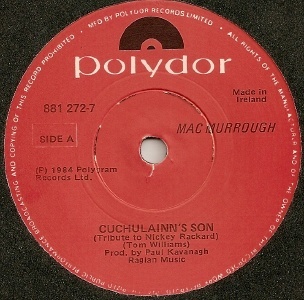 Notes: For those who choose to believe the nonsense that Irish Polydor editions numbered in the low hundreds, it will come as a bit of a shock to learn that this single was issued twice, such was it's popularity! 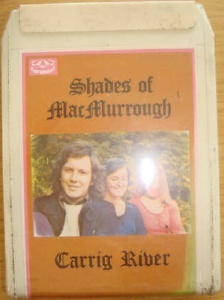 Note the 'colour cover' shown above has in fact been hand-coloured with red marker. LP - Polydor Records - 3188 009 - IRL 197? 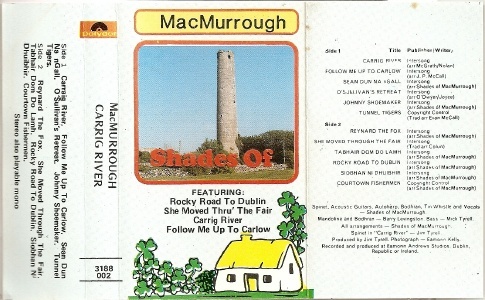 Taken from the Gael Linn 7"
Taken from the Merry & Fine LP.